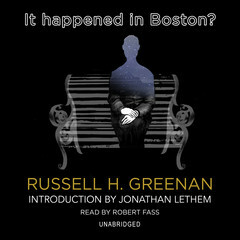 Audiobook Review: It Happened in Boston? By many accounts, the story of what happened in Boston falls into the genre of Speculative Fiction. After all, very early on in the book, it is revealed that the protagonist of the narrative is a time traveler! Yet, it is equally apparent as the story unfolds that time travel is not the main thrust of the story; nor are the crime, horror, or philosophical elements, so the book is disqualified from being catalogued into those genres as well. Why not just label it as “Fiction” and leave it at that? Because it is much more than an imagined story of what happens to a painter as he rises in his career arc before he is shattered by a tragic event. It is the story about his acute perceptions as an artist as he shifts his focus to the surreal even as his corporeal world falls apart. The style of the narrative has its precedents in Shirley Jackson’s The Haunting of Hill House and in Patricia Highsmith’s short story collection, Eleven. The narrator, absolute in his convictions and reasonable in tone, starts becoming unreliable in credibility; and the things he does become a matter of morbid fascination. The listener is swept up into the intimacy of the artist’s world as it narrows in scope down to a park bench in the Commons or his now-seedy apartment with its menacing pigeons on the window ledge. Written in 1968 and contemporary to its time, the listener might expect it to feel dated. While there is a decided old-fashioned sense to the scenes, like diners with sugar bowls, and a lack of twenty-first century technology like smartphones, the story is so richly and realistically depicted that the listener is “present” as much as the artist. Robert Fass is the audiobook narrator for “Boston.” His style is very mannered, but not affected and serves the language intelligently. The book warrants no less. It is not a slapdash adventure with vocabulary of middle grade complexity; but a rich and sophisticated feast of words that paints pictures, even as the artist in the story paints his portraits. Fass’ style is complimentary to the novel’s voice, clear and direct even as the protag’s vision becomes less so. Final notes about the overall production: There is an Introduction written by Jonathan Letham extolling Greenan’s ability to conjure the beauty of a fictional painting; but which also includes a major spoiler to the story. I would highly recommend skipping the Introduction (the first 7 minutes, 13 seconds of the audio after the opening credits) and listening to it after the story is over. There is also an Afterword by the author which talks about the difficulty in classifying the novel, and how it came to be written and received. Between the end of the story and the Afterword, I really wished there had been more of a pause, or an indication that the narrative was at an end so I could have savored the listening experience. The ending is powerful and deserves a moment or two to soak it all in before being hurled back into the real world. It Happened in Boston? deserves more than to be relegated to the obscurity of a backlist. It’s a classic in its own right. OTHER: I dnloaded a digital copy of It Happened in Boston? (by Robert H. Greenan, with an Introduction by Jonathan Letham; narrated by Robert Fass) from Blackstone Audio/downpour.com. I receive no monies, goods or services in exchange for reviewing the product and/or mentioning any of the persons or companies that are or may be implied in this post. This entry was posted in Audiobook Review and tagged audiobook, Audiobook Review. Bookmark the permalink. Let me say again publicly how much I appreciate your review. I’m writing to let you know that 5 additional seconds have been added between the end of the novel and the author’s afterword. Many thanks for pointing it out and I’m glad I was able to request the change.